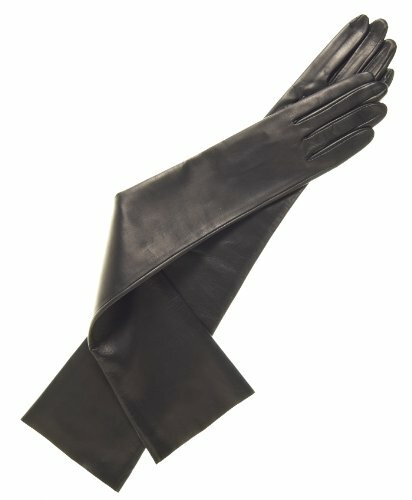 Striking in their elegant simplicity, these long leather gloves for women extend just over the elbow. They are made of the softest, finest Italian lambskin leather, classically styled in black with a very smooth appearance and incredibly fine machine sewing for almost invisible seams. Because they are unhemmed, no bulges or extra layers distract from their beauty. Made in Italy by the expert craftsmen at Fratelli Orsini, these are the definitive elbow-length leather gloves, perfect for the opera or any formal occasion. Made in Italy by Fratelli Orsini. SIZING HINT: These gloves run true to size.